Arteriovenous malformations (AVMs) are abnormal connections between the arteries and veins, bypassing the capillary system. They can occur in the brain and the spinal cord. In the brain, they have a propensity of being close to the ventricles, which are cavities within the brain that produce and contain the cerebrospinal fluid. They can also be associated with brain aneurysms. Brain AVMs are present in 0.02% of population, and have an annual incidence of 1 in 100,000 people. The cause of AVMs is not clear. Most people are born with them, but they can occasionally form later in life. They are rarely passed down among families genetically. In the normal circulation, the arteries are responsible for taking oxygen-rich blood from the heart to the brain. Then the blood passes through a network of small blood vessels called capillaries that connect arteries to veins and deliver oxygen to the cells. Veins return blood with less oxygen to the lungs and heart. An AVM disrupts this vital process. In most cases, AVMs remain asymptomatic, and are found incidentally on images done for unrelated disorder or at autopsy. However, as AVMs create a shortcut for blood to pass directly from high-pressure arteries to low-pressure veins and bypass tissue, it can lead to tissue damage, bleeding and death of the nerve cells. Over time, some AVMs get progressively larger as the amount of blood flow increases. As a result, symptoms may include, headache, seizure, weakness, numbness or paralysis, loss of vision, difficulty in walking and balance (Ataxia), difficulty in speaking (Dysphasia), and confusion or inability to understand others, depending on the location of the AVMs. In some cases, a weakened blood vessel may burst, spilling blood into the brain (hemorrhage) that can cause stroke and brain damage. Smaller AVMs tend to bleed more and larger AVMs tend to cause seizure and neuronal damage. Medical attention should be sought if any signs or symptoms of a brain AVMs are noticed, such as seizures, headaches or other symptoms. A bleeding brain AVM is life-threatening and requires emergency medical attention. The annual risk of bleeding from a previously unruptured AVM is between 2-4% per year. Unruptured AVM’s have been studied extensively and a common accepted classification exists that correlates relatively well with which AVMs that need surgery. The Spetzler-Martin classification takes into account the size of the AVM, the pattern of its venous drainage and its location in areas of brain with more or less important functions. Low-grade AVM’s are usually operated and high-grade AVMs are usually not operated. Mid-grade AVMs can be divided into sub-groups that can benefit form operation. Over the years, with the advent of endovascular therapy, the arterial blood flow to the AVM, is slowly closed changing it from a larger size to a smaller size and hence converting a previously inoperable AVM to an operable. Definitive therapy of AVMs is surgery unless they are located in a certain location of the brain where surgery would give the patient too much deficit. For these cases, stereotactic radiation such as Gamma Knife can be a good option. Gamma knife radiation takes up to 2 years to affect the AVM and during this time, the AVM is still at risk of bleeding. Some studies have shown a slight increase in the bleeding rate of the AVMs after gamma knife radiation. Endovascular therapy is not a definitive treatment option. It only improves surgical outcome. Closure of some of the AVMs vessels and associate aneurysms makes surgery easier. If the vessels of the AVMs are closed by endovascular treatment, over time, new pathological vessels will develop in the AVM and cause to enlarge. Figure : Ruptured AVM. A: Axial pre-operative CT Scan, B: Coronal pre-operative CT Scan. 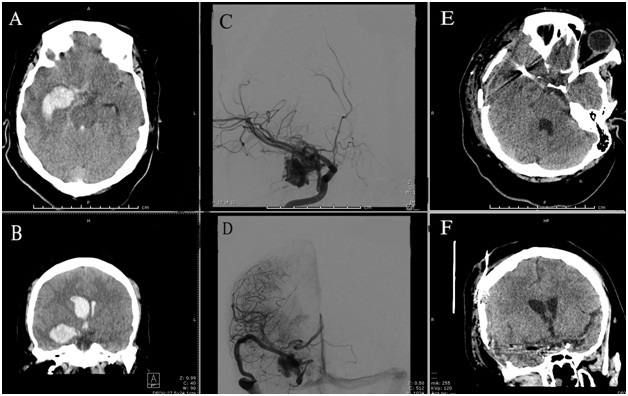 C: Cerebral angiography lateral view, D: Cerebral angiography frontal view, E: Axial post- operative CT scan, F: Coronal post-operative CT Scan.